Maya Warrier is a Reader in Religious Studies at the University of Winchester. 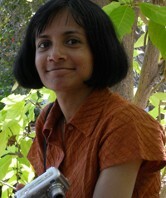 Her research explores popular Hindu traditions in modern transnational contexts. Her monograph, Hindu Selves in a Modern World: Guru Faith in the Mata Amritanandamayi Mission (Routledge-Curzon, 2005) examines contemporary forms of bhakti (devotion) and seva (service) practised by the urban Indian ‘middle class’ devotees of the transnational guru Mata Amritanandamayi (popularly known as Amma). Since 2005, she has been researching the development of Ayurveda (the ancient Indian system of medicine) in the UK, and has authored a series of articles based on this research. She is currently preparing a monograph exploring Hindu traditions in the Western ‘New Age’ complex. See her institutional homepage for more information. of Biomedicalisation and Spiritualisation’ in Sax, William et al. (eds) Asymmetrical Conversations: Contestations, Circumventions and the Blurring of Therapeutic Boundaries. Oxford and New York: Berghahn, Epistemologies of Healing Series. 2014. ‘Online Bhakti in a Modern Guru Organisation’ in Mark Singleton and Ellen Goldberg (eds) Gurus of Modern Yoga. 2012. Public Hinduisms. Co-edited with John Zavos, Deepa Reddy et al. London: Sage. 2011. ‘Modern Ayurveda in Transnational Context’. Religion Compass. 5, 3: 80-93. 2011. ‘Revisiting the Easternisation Thesis: The Spiritualisation of Ayurveda in Modern Britain’ in Paul Heelas (ed) Spirituality in the Modern World: Within Religious Tradition and Within Realms Beyond, Volume 3. Routledge.